We have just had the exam results in for ITEC Exams that took place in August 2018. 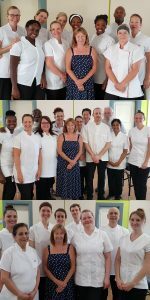 All our ITEC Anatomy, Physiology & Pathology, ITEC Massage, ITEC Indian Head Massage and ITEC Reflexology students passed their ITEC Theory and Practical Examinations. Congratulations to everyone – you all did very well. A Special Congratulations to Alex Orsi, Ian Finnis, Kariolina Cibirkaite (x2), Raisa Breslava, Fran Hudson (x2), Justyna Voyer, Karen Bruce, Lianne Robinson, Melvena Wallbank who scored above 90% in their Examinations (90% is the grading boundary for a Distinction). So far this Academic Year over 40 students have achieved over 90% and 6 students have achieved 100 % in their ITEC Examinations! This entry was posted in Massage Courses London and tagged examination results, ITEC, richdales. Bookmark the permalink.